Leaving from Moscow for Yaroslavl. Arrival to Yaroslavl. Cheking in in a choosen hotel. The excursion “Along the lime-trees boulevards” including the visit to the monastery of Our Savior and the Transfiguration. Lunch in a Yaroslavl restaurant. 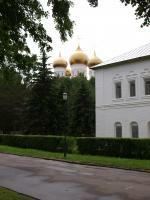 An excursion to the house of the Yaroslavl governors that is now an art museum. A fine lime tree park and a rich collection of works of the painters of the 18-19 century included K. Korovin and B. Kustodiev are situated there. The excursion to the museum “Music and Time” (the first private museum in Russia). Breakfast in a restaurant. Checking out. Leaving for Rostov the Great. Leaving to Rostov the Great. The excursion “The capital of Great fields”: the lake Nero, the Kekin’s gymnasium, the monasteries of saint Yaakov and the Varnitsi that is the birthplace of Sergey Of Rodanezh. The excursion into the Kremlin. Lunch in one of Rostov cafes. The price list of the tour for 1 person depended on accomodation and the size of the group. In the price included: accomodations, transport (a car or a bus), meal according to the program, excursions, tickets to the museums.